Say It & Write It Right! Say It & Write It Right! 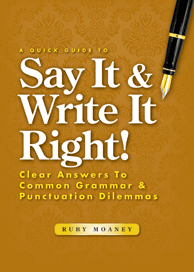 is a simple and easy approach to grammar. This little gem provides immediate answers to your questions on word use and sentence structure. Perfect for either academic or professional writing, this book is ideal for the on-the-go student or the busy professional.